This recipe is from my mother-in-law, she makes it whenever the whole family is over and it is devoured by adults and children alike. I made it for book club last month and it was a huge hit. 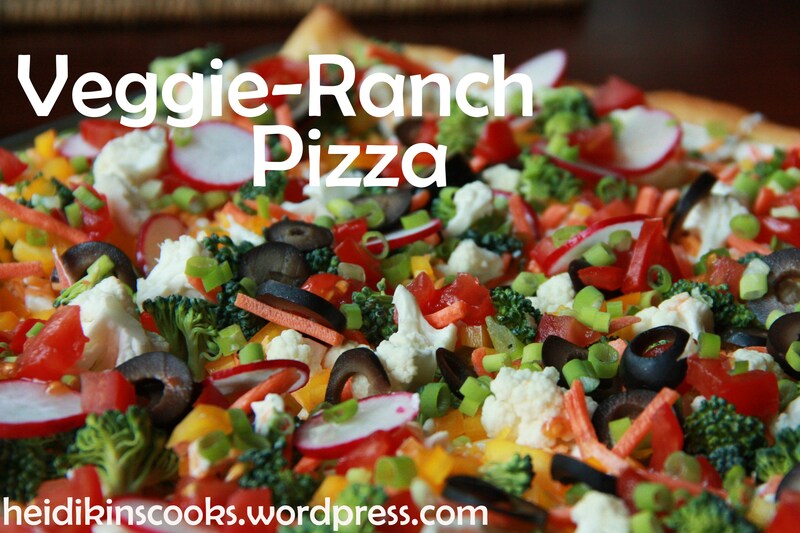 Now, this is not a traditional pizza, it’s served cold and has a ranchy-sour-cream-cheesey sauce and is topped with as many fresh veggies as you can cram in. It is delicious, and perfect for hot, summer weather! I tried to get all fancy and make my own pastry crust and failed, miserably. So then I went back to the grocery store and bought those pop-out-of-a-can Pillsbury rolls, just like my awesome MIL recommended, and it turned out perfect. Lesson learned: you don’t have to be fancy or home-made all the time, Heidi. Sheesh! Lay out rolls to cover a baking sheet or sheet pan, you don’t need to press them down, just lay them out so they cover the bottom of the pan completely. I had to trim mine a bit in the middle because they were a bit large and I didn’t want a crust-mountain diving my pizza. Bake until light brown (maybe 15 minutes? Keep an eye on it). Cool completely. Combine cream cheese, sour cream, and ranch dressing and spread over crust, don’t be stingy. 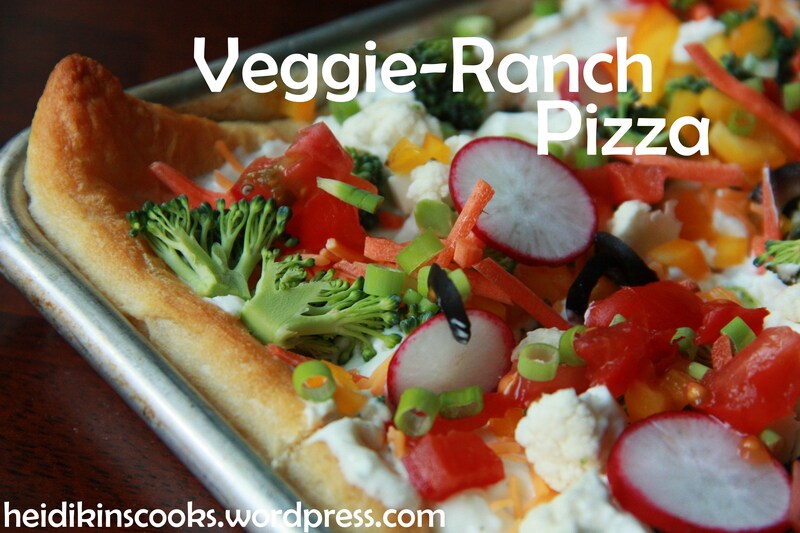 Sprinkle with cheese and all the veggies you have. I pressed the veggies into the sauce a bit to make them stick a little better.